Deck Railings don’t have to be boring or require constant upkeep. Create the look of wrought iron at a fraction of the cost. Deckorators deck balusters create deck rails that are the signature feature of a home's overall outdoor experience. When developing a deck design that reflects your personal style, consider how you want your deck railing to fit into the décor of your home. Do you want a deck railing that fits an overall sleek deck design (Classic Balusters) or do you want a traditional deck design which incorporates a colonial deck rail (Colonial Balusters). Possibly you want a deck design that creates a dramatic statement from your deck rail (Architectural Balusters or Scenic Glass). 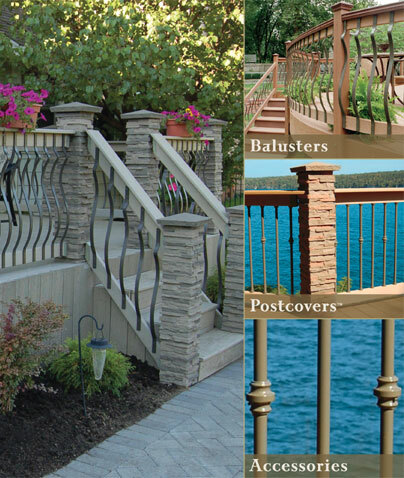 Whatever your taste, Deckorators offers the balusters to create a deck railing to meet your needs.